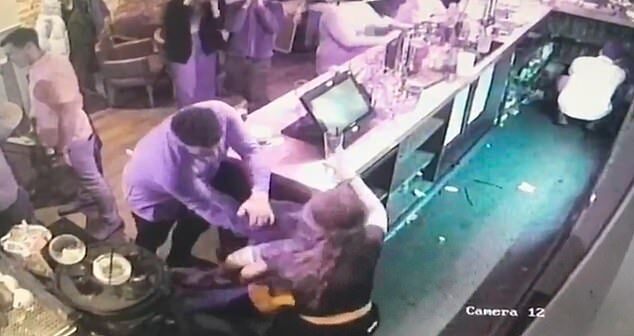 This is the shocking moment a bar manager passes out after being put in a headlock and 'strangled' by a colleague at a Christmas party. 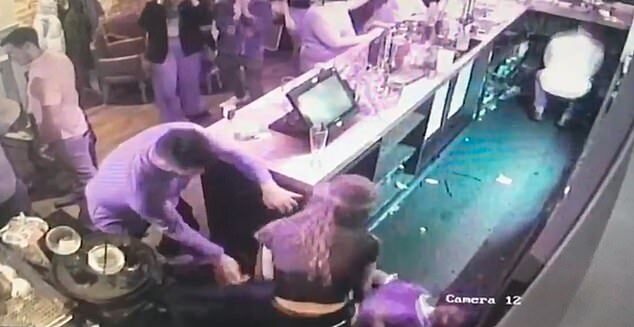 Molly Phillips, 24, collapses to the floor after chef and amateur American footballer Nathan Webb appears to put his arm around her neck and squeeze tight. Her arms go rigid as he holds her before eventually loosening his grip and leaving her lying behind the bar motionless. 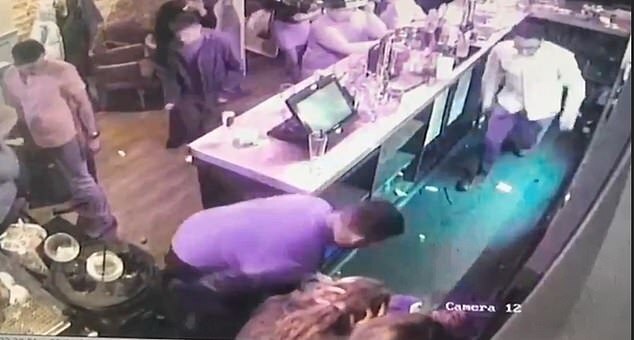 The incident at the Cameo Club in Cardiff, where the pair both worked, was caught on CCTV. And today the footage was played at an employment tribunal, which ruled in Miss Phillips' favour that she was unfairly dismissed when bosses failed to properly investigate her complaint that she was strangled at the party. She told the court she suffered such serious facial paralysis that she may never be able to smile properly again. The Cameo Club had its last Christmas party on New Years Day but the morning after the bash, she woke up and noticed she had slight facial palsy but was baffled as to why. 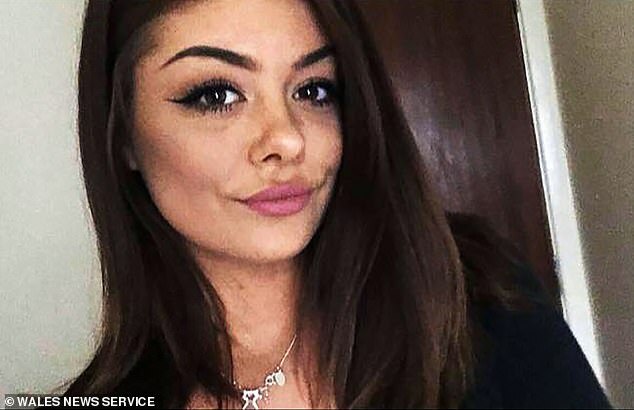 Fearing she was having a stroke, she went to the doctors but was told her injuries were 'either caused by lack of oxygen or nerve damage'. Returning to work, she viewed the CCTV to find out what had gone on and saw Webb appear to choke her. 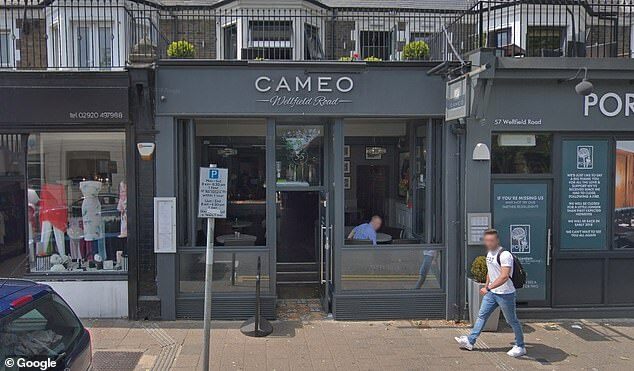 The tribunal heard that burly Mr Webb was arrested over the incident but released under investigation and remained employed by the Cameo Club after the incident. He is still employed by the bar. Ms Phillips initially returned to work after the incident and told bosses she did not want to take any action. At the same time, medics were telling her that the injuries she suffered would have longer lasting effects than previously thought. Yet when she raised these concerns with the directors of the company, she was told to get over it and ultimately felt she had no choice but to quit. In her judgement following the tribunal, judge Alison Frazer was heavily critical of the Cameo's directors for failing to take her concerns seriously. She said: 'The fact was the CCTV evidence showed that Mr Webb had her in a hold which caused her to fall to the floor. 'It was only open to the Respondent to take a view as to what action was appropriate after it had impartially gathered the facts via an investigation. Since the incident, Ms Phillips says that as well as her partial facial paralysis, she suffers from PTSD, anxiety and depression. She added: 'I can't smile in photographs. 'People don't notice it, but I notice it more than anything. But she said the worst bit was the fact her bosses didn't do anything. 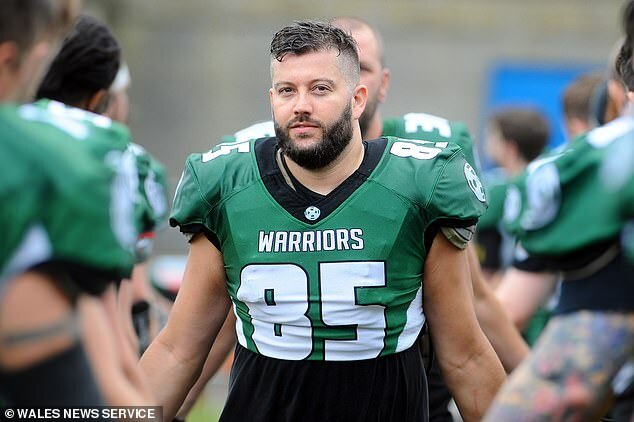 In her evidence at the employment tribunal at Cardiff Magistrates Court in November, she claimed the club's company director, Jason Pearce, was heard joking about the incident with Mr Webb. 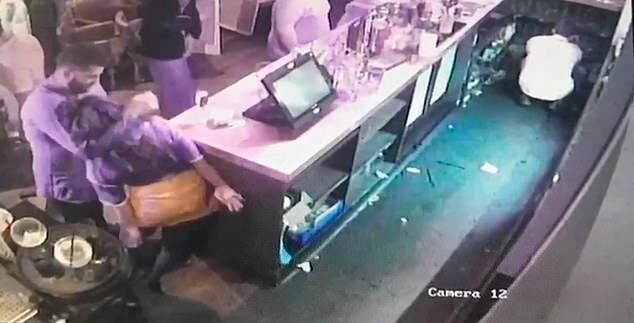 She also told the hearing that after other alleged behaviour by Mr Webb including putting chilli in a staff member's soup and threatening someone on a night out, she told her employers she had begun lose faith in their ability 'to keep her safe in her workplace'. She claimed she was told in one meeting on April 4 by another director Huw Davies to just 'get over it', and was told the same comment again on April 18. In her written judgement, Judge Frazer criticised the directors for not fully investigating at this stage. She wrote: 'She was able to carry on at work without suffering any real psychological effects, working alongside Mr Webb, until March. 'In March the Claimant observed two incidents that made her perceive the Christmas party incident in a different way. 'Rightly or wrongly, she formed the view from these incidents that he had the capacity to be violent towards women. This made her believe that she had been the victim of insidious violence at the hands of Mr Webb. 'Around this time, she also learnt that her facial paralysis was more permanent than initially anticipated. I find that this culminated in her feeling vulnerable around Mr Webb in the workplace. She said: 'Mr Pearce understood from observation of the CCTV that the Claimant had been strangled.